The movie “Lisa” (The Inspector) was filmed in London, The Netherlands and Wales in the summer of 1961. Stephen Boyd has been languishing for months waiting to film “Cleopatra”, so by the summer of 1961 he was more than ready to start the filming of a post Nazi- era drama with Dolores Hart. In Stephen’s unauthorized biography by Joe Cushnan, Cushnan quotes the author of “The Inspector”, writer Jan De Hertog. In the novel, the Inspector, Peter Jongman, is an older man, and there is no romance between himself and the girl he is rescuing, Lisa Held. The author had envisioned an actor like Spencer Tracey in the role. Obviously, 20th Century Fox wanted to add some level of romance between the characters, so they cast the much younger Stephen Boyd in the role of Jongman. Apparently Natalie Wood was the top choice for Lisa Held, but casting eventually led to actress Dolores Hart as the concentration camp survivor and heroine in search of Palestine. As Dolores Hart described it to journalist Sheilah Graham, “Now I’ve got Anthony, and Cleo has King Arthur” – meaning Richard Burton. Boyd and Hart had both already met and acted together about a year and a half earlier on the Playhouse 90 WWI drama, “To The Sound of Trumpets”. This movie was directed by Philip Dunne and included a host of top notch character actors; Finley Currie, Leo McKern, Donald Pleasance, Harry Andrews, Hugh Griffith and Robert Stevens. Much of the filming took place in damp weather in the Amsterdam and the Netherlands as the film crew searched for idyllic Dutch scenery. The filming then moved onto London, which is where most of the later Tangier scenes were filmed on a soundstage. The dramatic desert exterior shots of what is supposedly Palestine actually took place in Wales at Three Cliffs Bay. The crew and cast had to be rescued by a local lifeboat at one point when the converted trawler they were using was stranded in mud. The skipper feared the craft might roll over, so Boyd, Hart and director Dunne, and 32 other people had to be evacuated. Boyd and Hart also became close friends during the filming of this movie, to such an extent that Hart became quite enamoured with her co-star. At the time, Hart would deny any romance, but later in her autobiography “From the Ear To The Heart” she would confess that she on the verge was falling in love with Boyd, and was heartbroken when he rejected her overtures. The two would remain friends for many years after the filming of the picture, even after Hart made a life-long commitment as a Catholic nun in 1963. The Courier Journal (Louisville Kentucky) featured an extensive look at the making of “Lisa” in January 7, 1962. 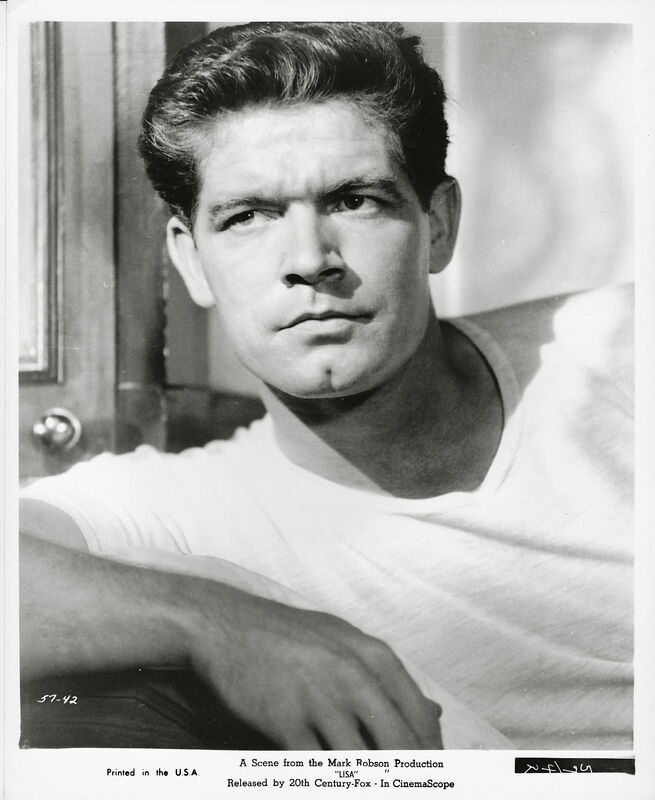 In early 1960, after the stupendous success of Ben-Hur, Stephen Boyd was a very hot commodity. Of all the actors who tried out to be the main love interest of Elizabeth Taylor in the soon to be filmed epic Cleopatra, Stephen Boyd won the part of Mark Anthony. Peter Finch was Taylor’s personal choice for Julius Caesar. Filming started near London in the May of 1960 and dragged on for months and months. The weather in London was damp and dreary (it’s not Egypt, okay! ), and Elizabeth Taylor became deathly ill. Hardly any usable footage was made. Peter Finch was about to lose his mind, and Stephen patiently waited and eventually came back home to Hollywood in December. The Director and most of the main actors finally quit, and the entire project had to be started over again, this time without Stephen. The film would eventually be released in 1963 with Richard Burton cast as Mark Anthony- and the rest is Hollywood History. Stephen’s one regret for having not completed Cleopatra was missing out on the chance to work with Elizabeth Taylor, who he called ‘a dream’. Stephen had put in a lot of work studying Anthony, and when asked if he would return to the project in July of 1960, he had this to say. Here are a few pictures of Stephen in costume from the filming of Cleopatra, and a short video which shows some footage which was recorded.